I’d been living in the UK for more than 20 years when the idea for my first novel, Crow Lake, came to me, but the inspiration for it was Canadian. It was a tale my mother used to tell about my great grandmother, who spent her life on a subsistence farm in eastern Canada and was so desperate for time to read that she fastened a book rest to her spinning wheel so that she could read while she was spinning. I’ve inherited a photo of her and she looks like a force to be reckoned with – small, straight and verging on grim: there would have been no discipline problems in that family! She was determined that her four children would get an education and escape the poverty of farming and she was successful in that aim; they all toed the line, worked hard and went on to better things. So hers was what you might call an inspirational success story. But from a writer’s point of view, inspirational success stories don’t necessarily make good fiction. It seemed to me that it might be more interesting if I created a family with the same dreams and values as my own and had them make great sacrifices, through several generations, until finally one child, one brilliant boy, got his chance to go to university and fulfil the family dream. And he blew it. I thought the fallout from that might make a good story. I set it in Canada, not just out of gratitude to Great Grandmother for the plot idea but because I thought it belonged there. Immigrant communities traditionally place great value on education and Canada is a country of immigrants. The precise setting of the novel – the fictional community of Crow Lake, in Northern Ontario – came about through a combination of nostalgia and laziness on my part. 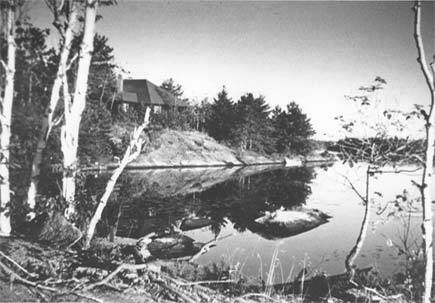 Northern Ontario, with its lakes and rocks and forests, is the landscape I think of when I think of home, and I placed the story there purely for the pleasure of revisiting it in my mind. I decided that Kate Morrison, the central character and narrator of the story, would grow up in a small farming community because (here’s where the laziness comes in) I grew up in one, and I hate doing research, and that meant I didn’t have to do any. I loved every minute of writing Crow Lake and when it was finished I found I wasn’t ready to leave it. So I set a second novel (The Other Side of the Bridge) in the fictional town of Struan, which is mentioned in Crow Lake as being the nearest town. Six years on, when working on the third novel, it was clear that it too belonged in the North. That novel was Road Ends. While I was writing the novels I vaguely thought of them as ‘The Crow Lake Trilogy’ or ‘The Struan Trilogy’ because they are linked in place and time and have several characters who appear in more than one book. Each book stands alone, though, and they do not need to be read in any particular order.